20th Century Fox has provided The Continuum the first image of Elektra in her new red costume from the Daredevil spin-off starring Jennifer Garner. "People were definitely bummed about the black outfit," Garner told MTV's Total Request Live. "They felt like she should be in red. This time, she's in the traditional red. I've got more on than that one piece of fabric because we didn't know how to do that and prevent it from being an X-rated movie." "We have our share of blowing things up and fights and action sequences," Garner said. "I've learned a few new weapons and I'm definitely fighting." The film is being directed by Rob Bowman. "She begins the movie in a very in a very tumultuous state and is sort of accidentally looking for something within her own self," Bowman said. "It is very much driven by Elektra's darkeness and by the change in her life that happens from when she is killed and comes back to life, and what your second life means to you," Garner said. Garner said she hopes to play Elektra a third time. "I would play her any day of the week and twice on Sundays," Garner said. "Hopefully, this goes OK and we can see what happens next." Cartoon Network has relased titles, air dates and synopses for the five episodes of Justice League Unlimited. "As the season begins, Superman addresses an awesome assemblage of heroes. He and the rest of the Justice League, which in the past included the Flash, Green Lantern, Batman, Superman, Wonder Woman, Martian Manhunter and Hawkgirl, have come to realize that the universe might be best served by enlarging the group, being more proactive and coordinating more effectively. The group assembles an awesome collection of superheroes and brings them together aboard the Watchtower, the orbiting space station. It's from this perch that Martian Manhunter monitors goings-on across the galaxies and assigns teams of superheroes to tackle problems. "But it isn't always smooth sailing for the members of the expanded Justice League. Superheroes usually work alone and have powerful, and idiosyncratic, personalities, so conflicts inevitably arise. Like any co-workers, these people don't always agree on the best way to solve a problem. But in the case of the new Justice League, these superheroes are dealing with civil wars, rogue criminals and rampaging monsters, so they must learn to work together. 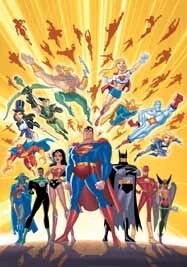 "The new roster of Justice League Unlimited includes some of the most famous superheroes around, like Green Arrow, Supergirl and Captain Atom. Other members may be a bit more obscure. Hawk & Dove are siblings with a very different take on conflict resolution techniques. B'wana Beast is a jungle man-turned-superhero, a combination of the Bronx and the Bronx Zoo. The Atom is the world's smallest superhero. Booster Gold, a glory-seeking hero from the future, joins the Justice League, as does Zatanna, a beautiful magician and sorceress. While there is a universe filled with new threats, a few classic villains return, including Lex Luthor, Soloman Grundy and Mongul." * Saturday, July 31: "Initiation"
A reluctant Green Arrow is asked to join the new Justice League. He, Supergirl and Captain Atom are dispatched on a mission to stop a rampaging nuclear monster in Asia. 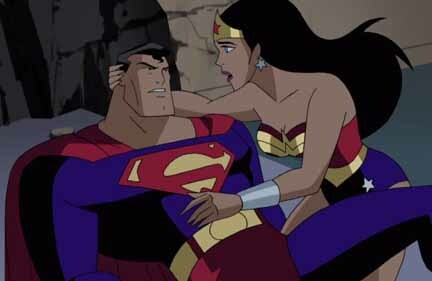 * Saturday, Aug. 7: "For the Man Who Has Everything"
Batman and Wonder Woman surprise Superman at the Fortress of Solitude, in order to bring the Man of Steel his birthday present. But when they arrive, he has been immobilized by a special "gift" that Mongul has delivered to him. * Saturday, Aug. 14: "Hawk and Dove"
Two siblings, one a pacifist and the other more aggressive, join Wonder Woman in a mission to stop a war between two neighbors. It turns out that the escalation of the conflict is all part of Ares' plan to spread misery. * Saturday, Aug. 21: "Fearful Symmetry"
When Supergirl begins having some very disturbing dreams, she gets help from Green Arrow and The Question to figure out what is happening. It turns out she may not be dreaming after all. * Saturday, Aug. 28: "Kids' Stuff"
Superman, Batman, Wonder Woman and Green Lantern are transformed into 8-year-olds in a desperate attempt to save the world from the magic of Mordred. For covers and previews of upcoming titles, CLICK HERE. 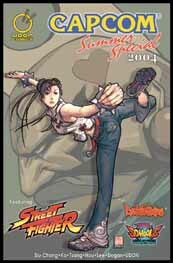 Titles include Transformers Generation One #6 from Dreamwave Productions, Ghost Spy #2 and NYC Mech #3 from Image Comics and Avengers #500 (24 pages) from Marvel Comics. Burger King Corporation is reporting that it Spider-Man 2 promotion has been a rousing success in its first few days. According to Burger King Chief Marketing Officer Russ Klein, nearly a million Spider-Active Kids Meal toys were sold on Tuesday of this week, historically the slowest day of the week for all quick service restaurants and only the second day of the Burger King promotion. The first three days of the promotion are already outpacing the hugely successful Shrek 2 promotion and is rivaling past Burger King promotions at their peak. In addition, over the past 24 hours the phones "have been ringing off the hook" at Burger King Corporation's headquarters with franchisees reporting that the point of purchase merchandising elements are disappearing. Everything from Spider-Man window decals, banners and even the Spider-Man Clearance bar element (for the drive-thru) have been reported missing -- and are becoming instant collectibles -- since first being displayed last weekend. "The Burger King Spider-Man 2 all-family promotion -- with a great toy program for children and the Spidey Sense game for adults -- is a perfect fit for our 'Have It Your Way' customer pledge," Klein said. "Our promotion, as well as the movie, offers universal appeal to children and adults alike." * After breaking opening-day box office records, more marks could be coming for Spider-Man 2 in its opening week. Analysts are estimated that the film could break The Matrix Reloaded's five-day record by the end of the holiday weekend, with more than $150 million. Spider-Man 2 debuted on Wednesday in 4,152 theaters and took in an estimated $40.5 million, which set the records for opening day and biggest Wednesday takes. For producer Avi Arad, CLICK HERE. 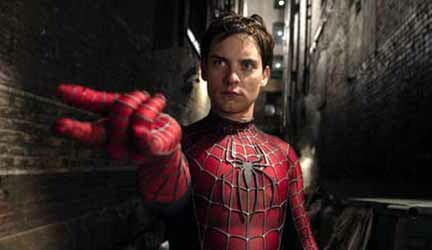 For Tobey Maguire, who plays Peter Parker/Spider-Man, CLICK HERE. For director Sam Raimi, CLICK HERE. For Alfred Molina, who plays Doc Ock, CLICK HERE. For James Franco, who plays Harry Osborn, CLICK HERE. For Kirsten Dunst, who plays Mary Jane Watson, CLICK HERE. Devil's Due Publishing has completed negotiations to publish its newest creator-owned comic series, Cannon Busters, "a hip, steam-punk action-adventure" created by LeSean Thomas. Udon Entertainment will assist in producing the book with Thomas. "I think this is a perfect fit," Thomas said. "It's been a tough road for this project, but it's finally where I think it belongs. Erik Ko, Adam Fortier and the folks at Devil's Due have shown great enthusiasm for the project and seem to have a great understanding for what I'm trying to do. With Udon in the mix, it will shine like it's supposed to." In addition to creating the book, Thomas will write and pencil Cannon Busters. J. Torres will co-script, and Ed McGuinness, Keron Grant and Skottie Young are among the artists who will provide guest covers. Cannon Busters #0, a Con-Exclusive premiere issue, will hit the summer conventions, including Comic-Con International and Wizard World Chicago, featuring a guest teaser story by Corey Lewis and an 8-page sketchbook featuring concept art by Lewis, a collaborative designer. The first issue of the bi-monthly series will be in comic stores in November. Josh Blaylock, President of Devil's Due, said: "Devil's Due Publishing began with creator owned material and we always felt strongly that the industry needs new talented voices to be heard. LeSean Thomas has a strong creative package put together for Cannon Busters, and I am happy to help the project be seen." Here's a color look at the Static Shock: The New Kid DVD, to be released on Sept. 28 by Warner Home Video. The first two issues of Proximity Effect, an original comic book property from Top Cow, have been read by more than 100,000 people on the Internet, according to the publisher. The release of the first chapters, representing over one third of the overall story, is part of a new marketing strategy by Top Cow. The story is concluded in a 96-page graphic novel filled with all the issues of the comic, bonus anthology stories and a cover by Top Cow founder Marc Silvestri. The book is now available for $9.99. "Proximity Effect is a whole new way for us to do business. We're excited about forming relationships with marketing partners outside of the comic industry to broaden our audience, as well as tap into the power of the Internet to reach a mass audience," said Matt Hawkins, Top Cow's President. Coming Saturday: Dark Horse news -- and much more!!! * For Saturday, June 26, including UDON/Capcom news, CLICK HERE. * For Friday, June 25, including an interview with Spider-Man 2's Kirsten Dunst, CLICK HERE. * For Thursday, June 24, including Justice League news, CLICK HERE. * For Wednesday, June 23, including Image Comics' solicitations for September, CLICK HERE. * For Tuesday, June 22, including Spider-Man 2 news, CLICK HERE. * For Monday, June 21, including Dark Horse solicitations for September, CLICK HERE. * For Saturday, June 19, including Spider-Man 2 news, CLICK HERE. * For Friday, June 18, including Spider-Man 2 news, CLICK HERE.